It’s more than a word. It’s a title that lingers over your head while you aimlessly venture throughout the worlds of your virtual life. People may ignore you, others will make your virtual life a living hell. The power is up to you to ward off the menacing “newbness”. I am new to virtual worlds. I joined Second Life two months ago, and just rediscovered my long lost, neglected IMVU account. The gateway drug for pixilated delight was Frenzoo, a site I’ve been a member of for about a year. I have grown a lot in Frenzoo, becoming spoiled with my acquired non-new status. I can no longer accept the title of “newb”, and will do anything possible to fight it off in the new virtual worlds I join. If you are like me, you hate the term too. So here are some tips to help shed your newbness. This is first on my list because it doesn’t require purchase and its relatively easy. It’s also essential for rising up in the metaverse. It shows that you are willing to make an effort, and there may be a teeny spark of virtual knowledge within you. Be sure you take advantage of every profile feature available: text color, background, media, interests, about me, and so on. Still, never give more information than what you are comfortable with. Don’t be afraid of the forums. It is a wonderful way to put yourself on the site and begin building your reputation and finding friends. You can even start by introducing yourself. At least you are putting yourself out there, showing you are a mature and real person. If you do post in the forum, remember your netiquette. Lines of emotes are frustrating to see and TyPiNg LiKe So is really annoying and hard to read. Moreover, flaming other users for no apparent reason is considered disrespectful and juvenile. Such posts will only perpetuate your newbness. The best way to show you are not a newb is not to look like one. That’s right, get rid of your newb clothing. For your first few weeks, check out any Freebie Shops. On Second Life and Frenzoo, finding cute freebies and cheap items are easy. In Second Life, there are clubs dedicated to scouring the site for Freebies. I am a member of Fabulously Free in SL, and there are always wonderful items available. One shop owner was selling beautiful dresses for 10L only. Meanwhile, Frenzoo has its own freebie shop, as well as an easy to navigate shop with a “cheapest items” option. IMVU is a bit harder. The only freebies are default clothing, and you want to get as far from defaults as possible. The best thing to do on IMVU is spend your money wisely. In the beginning, you can earn around 2000 if you follow the sign-up process correctly. That doesn’t go very far in IMVU, but it is a start. What I did before anything else is find a head, skin, and a full body outfit that included shoes. 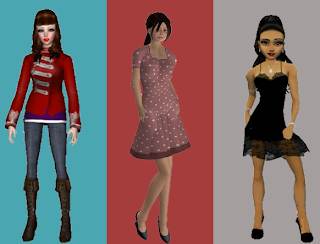 If you want to find the best outfits in any virtual world, you will eventually have to purchase some of that world’s currency (Linden, coins, credits). For those of you who are a little stingy, like me, then spend your money on clothing wisely. Don’t buy without trying an item on first. It helps to look around before settling on an item, too. Here are all of my avatar's now. My Frenzoo avatar is a year in the making, but my Second Life avatar is only two months old, and my IMVU avatar was revamped just last week. I hope this helps some of you metaverse newcomers fend off the newbness title over your pixilated heads. If you are still finding difficulties in the first few weeks, remember your netiquette and ask older members questions. I have found a lot of nice and helpful in all the worlds I am apart of. They graciously answered my questions and helped me become more familiar with the site. Feel free to add any other tips related to this. Great tips! I was sad at having to be labeled a "newbie" again when I joined Frenzoo several months ago. After being a long time member on other chat sites, it can be a bit intimidating & frustrating to go back to newbie status. One thing that helped me transition was the "olive branch" of friendship that I was offered upon joining. Receiving a warm welcome from veteran members can make all the difference to a person when they first join a new site. It also helps if newbie's return to their forum posts to keep the dialogue going after being welcomed by existing members too. I've seen many new friendships develop from the back & forth chatting in a new members introduction post. If you're a veteran member, remember often a new member feels like they're walking into a crowded room, where they don't know anyone so offer them an "olive branch." And if you're just joining a new site, reach out & grab it! Great Blog Miidasu! Wonderful tips! I wish you much success.